Choosing the right shoes for your preschooler doesn’t have to be hard. It may seem like there are an overwhelming number of options, and buying shoes for toddlers and preschoolers seems like a daunting task. But if you know what to look for and how to know what fits best, you’ll be golden. Here are some tips for finding the best shoes for preschoolers. These tips will save you a headache now and your child from trips and falls later. I know I said that choosing shoes for preschoolers doesn’t have to be hard. In full disclosure, though, there is a lot to know about purchasing the right shoes. As an adult, I know you know that not all shoes are created equal, as evidenced by our shoe closets. Bonus! This article has a FREE printable at the end of the post! I’m sure you’ve done this before. You’re out shopping, by yourself for once. You decide to treat yourself to a beautiful pair of red, patent leather (at least they are designed to look like leather) pumps with a heel that’s not too high and not too low, but just right. They are classy and timeless, and unfortunately cheaply made. You try them on, and they squeeze your toes a little and rub strangely on your ankle. That’s ok because you’re sure you can break them in by wearing them around the house with some socks on. They are beautiful, and on sale, and you can’t resist such a deal. So you buy them for $24.99 (marked down by $15!). And the next Friday you wear them out on a date with your husbeast (endearing, isn’t it? ), who comments on how beautiful you look. And you do feel beautiful. But before you even get to dessert your feet are killing you. Those red heels go back in the closest, only to be pulled out for church on Christmas which is when you remember why you never wear them. You bought poor quality shoes, and you shouldn’t have. They were not worth it, despite the killer deal. Those red heels were cheaply made and poorly designed, which is why they hurt your feet. The black Mary Jane heels, on the other hand, are higher quality. This is why you wear them so much more frequently. The same is true for children. Not all children’s shoes are created equal. It’s especially important to make sure we are choosing the right shoes for preschoolers because their feet are still growing and their gait is still developing. Putting them in the wrong shoes can have some regrettable consequences. The first criteria, right off the bat, is the shoe material. The child’s age can definitely play a factor in this. Toddlers need shoes to be lightweight and flexible; more comfortable walkers can have shoes with grip. Preschoolers need shoes that are sturdy, but still flexible. You should easily be able to “fold” the shoe in half or twist the toe. Shoes modeled after popular adult shoes (like Converse, Crocs, flip flops or cowboy boots) aren’t really designed with children or child’s play in mind. Avoid backless or slip-on shoes. Laces, Velcro, or other fasteners are best for keeping shoes secure. This way your child can focus on learning or becoming comfortable with walking instead of keeping the shoes on their feet. Buying too stiff or supportive of shoes won’t allow the toddler’s feet muscles to do their work. They should still be protective but flexible. The shoes should be flexible and fully attached and shouldn’t go over the ankle or elevate the heel. 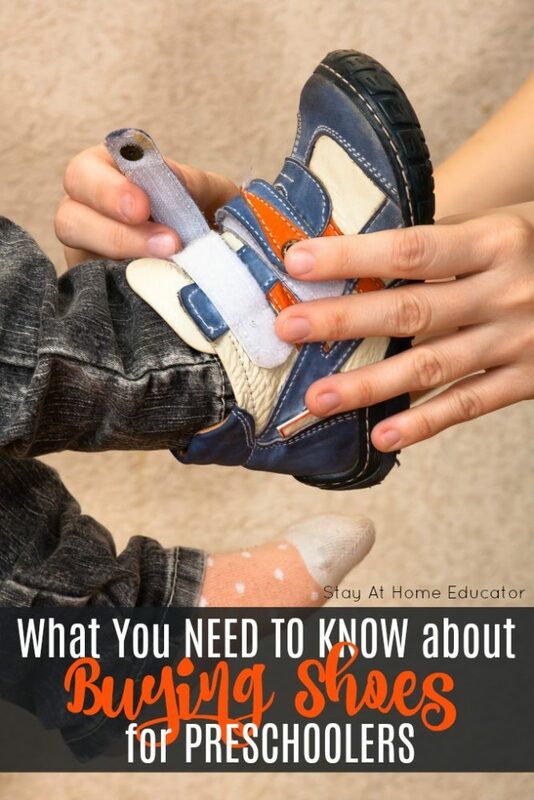 The sole needs to bend with the foot (so your preschooler’s feet can do their job) and overall, they should be comfortable. Children’s feet perspire heavily, and the upper part of their shoes should be made of breathable materials. Leather, canvas, or newer mesh materials allow the feet to breathe. Also, make sure the insole is made of absorbent material. There are some basic temptations we all fall privy to when it comes to buying kid shoes. I know, it can be tempting. “They seem to grow so fast, doesn’t it seem like a good idea to buy their shoes a little big? They’ll grow into them right?” There’s nothing wrong with not overspending on shoes for your preschooler, but too big of shoes makes learning how to walk and walking safely that much harder. Don’t give in! Your child deserves it. Knowing that you’ve found the best fitting shoes for your preschooler comes down to them not being too tight. There should also be about half an inch from the edge your child’s toes to the edge of the shoe. You may consider downloading Pediped’s size chart or phone app to help you measure correctly. Some specific tips for measuring: Feet swell over the course of the day, so the best time to size your child’s feet is later in the afternoon or in the evening. Always measure when standing. Measure both feet! One is usually bigger than the other so you need to make sure to accommodate the difference in size. Length isn’t the only important part of a properly fitting shoe. Width is a factor to consider too. If the length fits but the width does not, then you have the wrong shoe, and visa versa. Sometimes you might need to try several brands and styles. Both length and width should fit properly. If you feel your child is old enough, you can always ask which shoes your child prefers out of ones you have found that meet all of this criteria. It’ll make the shoe shopping experience more fun for them and they’ll be happy to wear and play in the shoes they thought were comfortable and had a color or design they liked. It’s going to happen. After you’ve found the perfect pair, eventually your child will grow out of them. Here’s how to know when it’s that time. FootCare MD shared that under 16 months of age, infants’ feet can grow more than half a foot size in two months. Between 16 and 24 months they grow an average of half a foot size every three months. Toddlers 2 to 3 years old grow half a foot size every four months, and children 3 and older usually between four and six. It’s recommended to check for growth about every 2 months to be safe. Your preschooler may not complain if their shoes get too small or too tight, so check for any of these signs that will show you it may be time for new ones: overly worn areas, stressed seams, bulging sides, or toes that bend upward, and make sure their toes aren’t rubbing against the front of the shoe. Do you have some preschool parents who might benefit from this article? Why not give it to them! Click the image below and get a condensed version of this article to print and hand out to your preschool parents! I appreciate your statement about how certain designs of shoes are not best suited for preschool children. I really do think it’s best to focus more on their comfort, so they would be more at ease with their walking. I’m planning to enroll my son next school year and I’m researching about things to consider for his first year of schooling. I’ll be sure to remember your tips. Thanks a lot! Picking out shoes can be tricky because what is best for our children’s feet are not always what is good for them! I’m glad this article is helpful to you. By the way, I have added a free printable so you can print it and take it shoe shopping with you. Yes, it is. And it’s important to consider how the material effects foot development. It’s terrifying to think that there might be some parents out there who buy shoes for their kids which they find aesthetically-pleasing to the eye but without really considering if it’s a comfortable fit for their kid. I agree that the fit of the shoes can “make or break” your child’s healthy food development. And if parents take for granted the important of buying comfortable, breathable, and right-fitting shoes for their kid today, the child might have more serious foor, gait, or posture problems when they grow older. Also, when I buy shoes online for kids, I find this online shoe size converter (https://www.blitzresults.com/en/childrens-shoe-sizes/#children-shoe-size-converter) to be particularly helpful. I only have to input the child’s foot length and his appropriate age group and the calculator will show me the appropriate shoe size in various sizing systems (like in EU, UK or Asian sizes). This helps reduce the chances of buying shoes that don’t really fit the child well. Buying shoes for children is very tricky, the key is to buy a shoes that has been designed to promote healthy foot growth. It can be very troublesome later on if foot health wains which is what happened to me when I was a youngster. I get my kids school shoes from Startriteshoes.com as they are wearing them the bulk of the day I want them to have the best quality, I’ve found that the supermarket bought shoes do often don’t last as long especially with the vigor of the school playground.